I work for food: literally! Obviously I have a full time job that allows me to pay bills, take vacations, try out new restaurants, buy shoes and jewelry and treat myself to chocolate, flowers, and kitchen dishes. I also have a freelancing job which allows me to test (and keep!) different kitchen tools, food products and recipes. That's what I've been doing for Robyn Webb's Fabulous Food Finds for the last year. Robyn finds the products, comes up with recipes and writes up the posts; I'm the chief cook, photographer and editor. I like some recipes more than others, same goes with products. Some I use quite a bit, some are hiding somewhere in one of my "garbage" drawers. That's just how things go. My friend Paige keeps on asking me to write a post about my favorite kitchen tools and if/when I do, many of them would be the ones I've "inherited" from Robyn. I wanted to share with you two recipes I've cooked in the last few weeks for Robyn. The first one is Sauteed Spinach with Marash Peppers. Do you know how long it takes to wilt 3 pounds of spinach? At least 15 minutes, unless you have a really large pan. It's almost magical to see what 3 pounds of spinach turns into after it meets some heat. Needless to say, I had quite a bit of spinach left after eating this dish a few times. What to do? I decided to make a frittata: it could not have been easier. I sprayed a round pie Pyrex dish with some oil, added sauteed spinach (without nuts!) to the bottom of the dish, added half a can of chickpeas and poured a mixture of 4 eggs, salt & pepper and a bit of milk on top. In the oven it went for about 25 minutes at 375. I then sprinkled the entire dish with shredded cheddar and let it hang out in the oven for 5 more minutes. This was great both hot out of the oven for dinner with a side of a salad and cold the next few days for breakfast. The second recipe is Salad Nicoise. 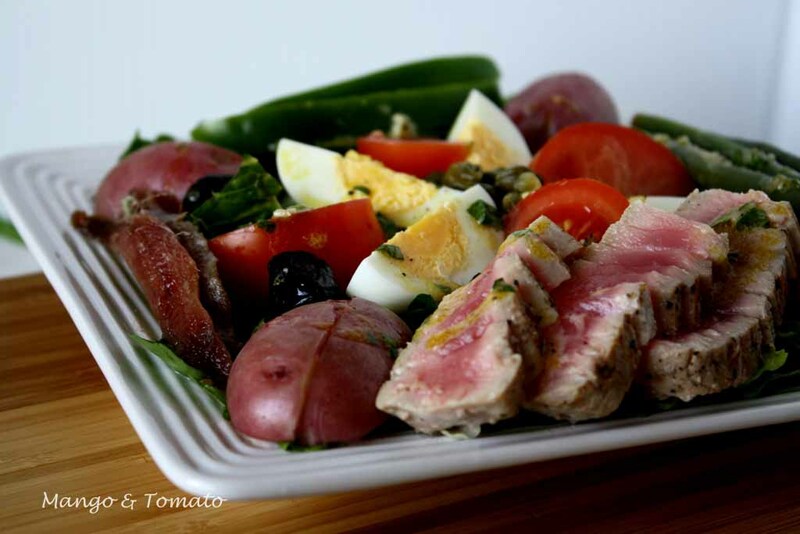 This is not the first time I've made Salad Nicoise for Robyn, but this one used actual tuna steaks: love! It is a great salad to have year round as it includes potatoes, green beans, eggs, tomatoes, peppers and lettuce. In this rendition, Robyn added watercress, which I really enjoyed. You can layer the ingredients together for a fancy look, as I did on the photograph below, or you can also mix everything together in a bowl. Don't like green beans? Add asparagus. Don't want to use tomatoes when they are not in season? Add jarred roasted peppers. Make this salad your own. I just received an email from Robyn with the recipes I'm making for next week: they are fun and simple, which is exactly what I need as this weekend is going to be busy! A friend is visiting from out of town tomorrow, then my furniture is supposed to be delivered and at night I'm going to Saturday Night Sips. And then Sunday I have a fabulous date lined up!!!! Not the kind of date you'd think though....it's another baking adventure with Jenna of Modern Domestic and this time around we've invited Mary of Arugula Files to come along and play in my kitchen: Whoopie pies are the plan! What are your culinary adventures for this weekend? Have a great time! one of my favorite posts! and the photos look gorgeous. next up a post on the tools? Sounds like you ladies are going to have a great time this weekend. Baking dates are so much fun! We've got dinner plans with friends tonight, and tomorrow night and then I'm headed to a fancy brunch on Sunday! A lovely & well written informative post, Olga! I don't think that I wished you already a Happy & joyful 2011 filled with good health & good food! I just moved my blog to wordpress.com / Come over @ my blog & check it out! You must update your RSS though! I'm going to make the last two recipes I've posted on my blog: oven-fried buffalo wings and baby back ribs (technically, the ribs recipe posts tomorrow). If you're even a moderate fan of buffalo wings, you have to try my oven-fried recipe! What a fun date night! My mom is in town so we have cooking on the agenda too.. but not before wine tasting, and a chocolate tour @ Theo's. Yummm. What beautiful pictures and a great post! I would have never thought to put pistachios with spinach. I will have to try that. 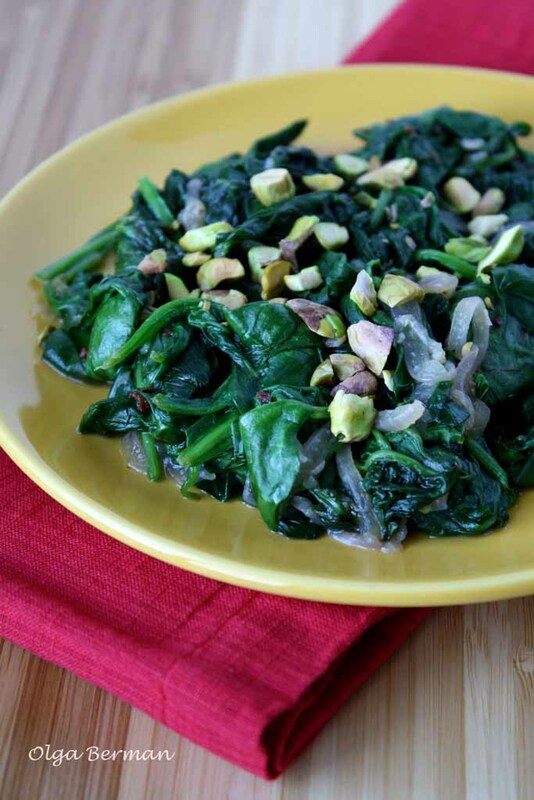 Love the pistachios with spinach! Lovely post & pics! so....when am i getting that post request fulfilled, eh? ?